15 year old, buckskin, quarter horse mare - about 15 hands. Scotch is the perfect school horse because of her size and her awesome temperment. She is kind, quiet, knows her job very well and is a great jumper. 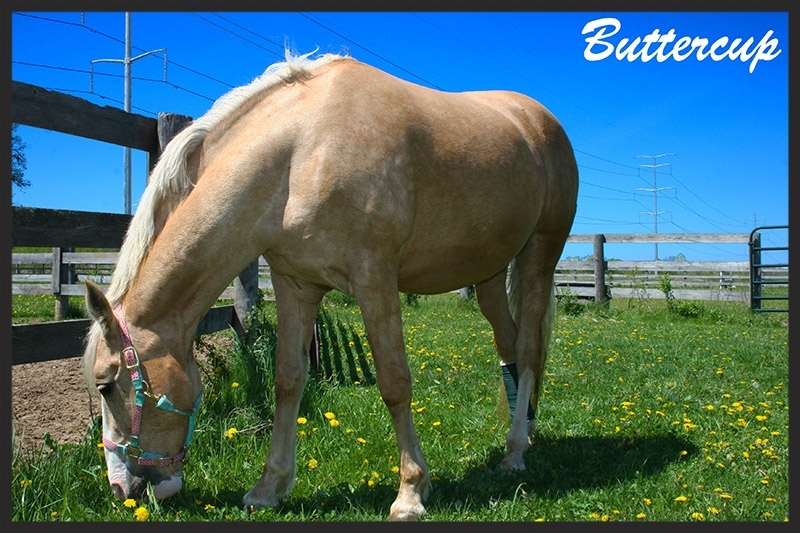 15 year old, Palomino Quarter horse/Mountain horse. “Butter” also requires a more skilled rider as she has lots of “enthusiasm” much like the energizer bunny! However, she is referred to as the “Barn Mother” because of her lovely, quiet temperament in and around the barn - she’ll stand quiet forever and let the smallest child pet her!!! 16 year old, TB/Warmblood gelding - 16hands. Artie is used for our more intermediate and advanced riders. He is a beautiful jumper but requires a skilled rider. 16 year old, small Welch pony. She is great for small riders of all levels as she has a lot of get-up-and-go and is an awesome jumper. However she is also perfect for our young, beginners. Email: kathy.happ@mac.com - Phone: 262-236-9101 - Address: 8104 W. Highland Rd.